To start this afternoon we had quite an adventure.... I'm in the kitchen mixing everything together for a loaf of Pumpkin Coconut Bread with Cinnamon Cream Cheese Filling while Matt's playing Skyrim... I hear someones smoke detector go off then I hear another alarm sound... What is that is what I first thought.... I open our door into the hall way and it's the fire alarm for our building and our hall way was full of smoke.... I scream at Matt that we need to get out of here, I was panicked... I turn off the oven and our coffee pot...the first pair of shoes I see are my dress shoes, I grab a coat, umbrella and my purse while Matt grabs the keys and his coat and we high tail it to the door.I know I look like a homeless person, since I was relaxing today in my yoga pants with dress shoes on but when you are panicked like that, you'd don't care what you look like! We get in the hall and our new neighbors ask if it's the fire alarm and they come running out too.. Everyone on our floor made it out and we ran down the stair to the parking lot.. but no one else was coming out?? At this moment I'm thinking the floor we live on is on fire and people are crazy for staying in the building... Granted the alarms ALWAYS go off in the building across from us... but this is the first time in 3 years ours have gone off. Back in September I met my mom for dinner at the Tarentum Station... 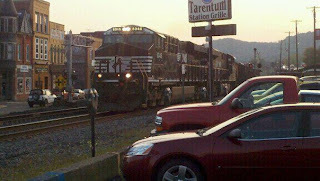 While waiting for her a train happened to be passing by the station and I snapped the pic to the right. The food was really good... We both had a fish entree... I had the daily special, which I think was a scrod Romano and risotto as my side.. The risotto was really good! I could of just ate that and I would of been happy. The only draw back is the noise in the restaurant... It is an old train station and open inside but it is hard to hear whoever you are sitting with talk, if they have a full house. Other than that, this place is a go! We spent one day walking around downtown Pittsburgh.... I think I saw more of the city that day than I have ever seen.... We ended up in Market Square to grab a bit to eat at NOLA on the Square for lunch. We wanted to sit outside but it was packed, so we got a table outside. I ended up getting their Brasserie Steak Salad, which was made up of Seasonal Greens, Hanger Steak, tomato, Hard Boiled Egg, Fresh Mozzarella, VooDoo Fries and Vinaigrette. Very good and the fries were really good too.. This is a place Matt and I have on our list to go back to. That evening we went to Max's Allegheny Tavern... Which was a hit with everyone and always was with Matt and I... We left with full bellies! Next up was Fuel & Fuddle in Oakland, we took a break from the Carnegie Museum and walked down to grab lunch. We split the baked brie... I'm not a fan of Brie, but this was good.... I had the holy guacamole salad, which was HUGE but also good... I ate about half of it.. it had aeared baja style beef with corn chips, fresh salsa, sweet corn, monterey jack and cheddar cheeses and sour cream over mixed greens with guacamole dressing. After lunch we went back to the museum and there is a really neat photo exhibit of Pittsburgh... I think it was my favorite part of the museum... I'm a sucker for local history.